This week, Betsy DeVos, President Trump's lamentable Secretary of Education, proposed new rules for implementing the Department of Education's Borrower Defense to Repayment Program. 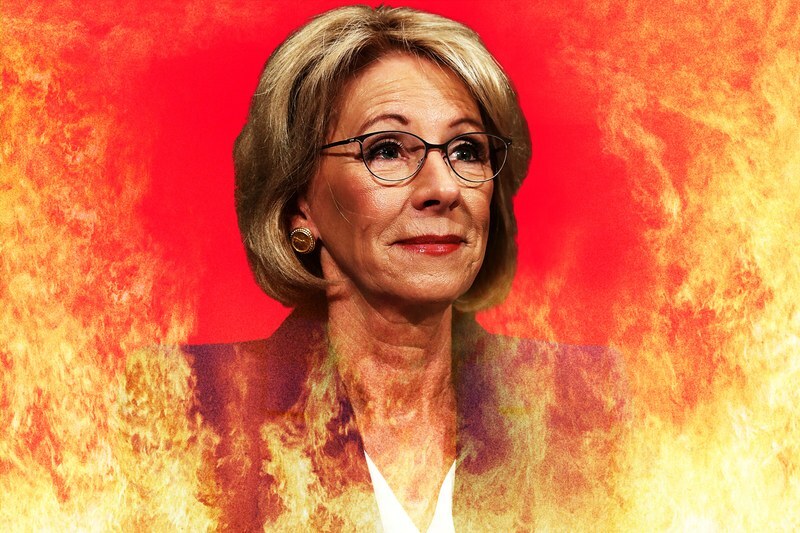 The new rules--433 pages long--outline the DeVos regime's procedures for processing fraud claims filed by students who took out federal loans to attend for-profit colleges and were swindled. The New York Times and Steve Rhode of Get Out of Debt Guy reported on this development, but Rhode's analysis is more comprehensive and insightful than the Times story. Rhode's essay is the one to read. Millions of Americans have been defrauded by for-profit colleges--literally millions. Corinthian Colleges and ITT Tech filed for bankruptcy, brought down by regulatory pressures and fraud allegations. Those two institutions alone had a half million former students. Globe University and Minnesota School of Business both lost their authority to operate in Minnesota after a Minnesota trial court ruled they had misrepresented their criminal justice programs. Last month, the Minnesota Court of Appeals partially upheld the trial court's judgment, finding sufficient evidence to support a fraud verdict on behalf of 15 former students who testified at trial. In California, DeVry University agreed to pay $100 million to settle claims brought by the Federal Trade Commission that it had advertised its programs deceptively. In the wake of that scandal, the company owning DeVry changed its name from DeVry Education Group to Adtalem Global Education. agreed to pay $95 million to settle fraud claims brought against it by the Justice Department, but the settlement is paltry compared to the amount of money borrowed by 80,000 former students. And there have been numerous small for-profits that have been found liable for fraud, misrepresentation, or operating shoddy programs. The for-profit scandal is a huge mess. If every student who was defrauded or victimized in some way by a for-profit college were to receive monetary restitution, it would probably cost taxpayers a half trillion dollars. So how do we fix this problem? The Obama Administration approved rules that would have streamlined the process for resolving student-fraud claims, but Betsy DeVos pulled back those rules just before they were to have been implemented. The new DeVos rules, summarized by Steve Rhode, put most of the blame on students for enrolling in these fraudulent and deceptive for-profit colleges. According to DeVos' DOE, "students have a responsibility when enrolling at an institution or taking student loans to be sure they have explored their options carefully and weighed the available information to make an informed choice." DeVos' janky new rules forces fraud victims to continue paying on their student loans while they process their damned-near hopeless fraud claims, while DOE processes those claims--if at all--at a snail's pace. DeVos nixed the Obama administration's ban against mandatory arbitration clauses that the for-profits have forced students to sign as a condition of enrollment. Sometimes these clauses also bar class action suits. So under Betsy DeVos' administration, many defrauded students will be barred from suing the institutions that cheated them. 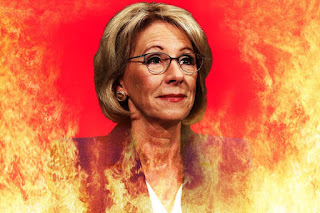 Betsy and her for-profit cronies want struggling student debtors to enroll in long-term income-based repayment plans (IBRPs) that last from 20 to 25 years. Payments under those plans are generally so low that student debtors' loan balances are negatively amortizing. Borrowers in IBRPs will see their loan balances go up month by month even if they make regular monthly payments. In other words, most IBRP participants will never pay off their loans. 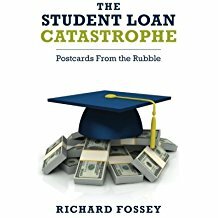 Some people are predicting the student-loan scandal will eventually lead to a national economic crisis similar to the one triggered by the home-mortgages meltdown. I am beginning to think these doomsday predictors are right. Already we see that student loans have impacted home ownership and may even be a factor in the nation's declining birth rates--now so low that the American population is not replacing itself. 1) First, the for-profit college industry must be shut down. No more University of Phoenixes, no more DeVrys, no more Florida Coastal Universities. 2) Second, everyone who was swindled by a for-profit school should have easy access to the bankruptcy courts, so they can shed the debt they acquired due to fraud or misrepresentations and get a fresh start in life. And there is a third thing we need to do. Congress should impeach Betsy DeVos for reckless dereliction of duty and blatant misconduct against the public interest. Let's send her back to Michigan, where she can enjoy her family fortune as a private citizen and not as a so-called public servant. Mark Brunswick. Globe U and Minn. School of Business must close, state says after fraud ruling. Star Tribune, September 9, 2016. State of Minnesota v. Minnesota School of Business, A17-1740, 2018 Minn. App. LEXIS 277 (Minn. Ct. App. June 4, 2018). Sarah Cascone, Debt-Ridden Students Claim For-Profit Art Institutes Defrauded Them With Predatory Lending Practices. Artnet.com, July 23, 2018. Erica L. Green. DeVos Proposes to Curtail Debt Relief for Defrauded Students. New York Times, July 5, 2018. Steve Rhode. A Deep Dive Into the Debtor Blaming 2018 Borrower Defense to Repayment Program. Get Out of Debt Guy (blog), July 25, 2018. Reuters. DeVry University agrees to $100 million settlement with U.S. FTC. Reuters, December 15, 2016.